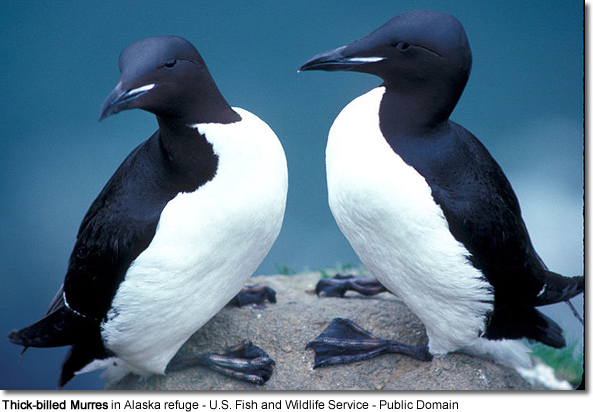 Uria is a genus of seabirds in the auk family known in Britain as guillemots, in most of North America as murres, and in Newfoundland and Labrador as turr. These are medium-sized birds with mainly brown or black plumage in the breeding season. They breed on the coasts of the northern Atlantic and Pacific Oceans. 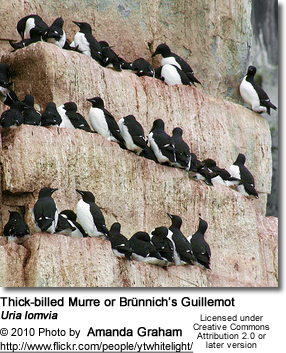 Uria auks are relatives of the Razorbill, Little Auk and the extinct Great Auk and together make up the tribe Alcini. Despite the similar common names, they are not so closely related to the Cepphus guillemots which form the tribe Cepphini. U. brodkorbi is interesting insofar as it is the only known occurrence of the Alcini tribe outside the Atlantic. It suggests that the Uria species, which are the sister taxon to all the other Alcini, and like them are usually believed to have evolved in the Atlantic, may have evolved in the Caribbean or possibly close to the Isthmus of Panama. 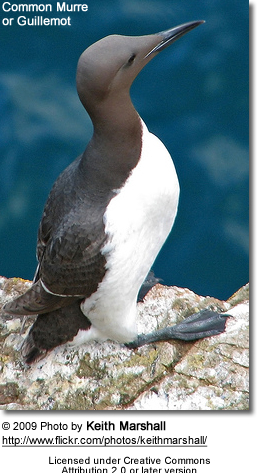 These birds breed in large colonies on coastal cliffs, their single egg being laid directly on a cliff ledge. They move south in winter to keep in ice-free waters. They dive for food from the surface, swimming underwater. They mainly eat fish and crustaceans, also some mollusks, insects and plant material.